Given: The cathode voltage is 22.5V and the cathode resistor is 390ohm. Problem: What's the cathode current? Given: The cathode voltage is 20 and the intended bias of a tube is 40ma. Problem: What value cathode bias resistor is needed? Given: The cathode bias resistor is 140ohm and the current 48ma. Problem: What's the expected cathode voltage? Given: The plate voltage is 450V and the (idle) cathode current is 50ma. Problem: What is the plate dissipation at idle? Regarding a 25W tube, 22.5W is 90% of its maximum rated Pd. According to Patrick Turner, a PP amp's idle cathode bias - for optimal balance of both tube longevity and power output - should be set at 66% of its maximum Pd. However, many amps (as examples: the Dynaco ST-70 and the Leak TL/25+) were designed to run their output tubes higher than 66% of their maximum Pd. Problem: let's shoot a small AC voltage through the grid of a tube, then measure the AC output current on the plate connected from a resistor to a constant DC voltage source. The current will be controlled by placing a constant current source (CCS) in the cathode circuit. 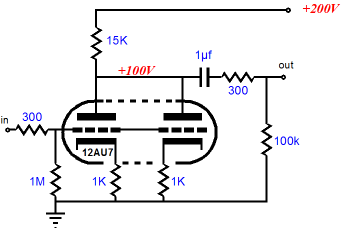 Here is a transconductance unit converter. Related proportionately to transconductance, mu is the gain in AC plate voltage due to a change in AC grid voltage - given a constant plate current. mu has no unit of measurement. It's expressed as a pure number - often referred to as the amplification factor of a tube. Let's shoot another AC voltage signal (100 mV) at the grid, then measure the resulting AC voltage on the plate. (The plate needs to be connected to a high impedance load for the results to be accurate.) With 100 mV AC on the grid and a mu of 20, what is the voltage on the plate? From an EL34 datasheet (in which an EL34 is strapped as a triode), the mu is 10.5 and the gm is 11.5 mA / V, what is its internal plate resistance? Below is a list of approximate internal plate resistances (in ohms) for a select set of power tubes. Insofar as pentodes and tetrodes, the internal plate resistances are given - as strapped as triodes. 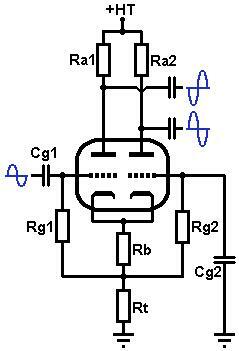 Below is a very simple (triode) circuit, used as the input stage of many amps. Much of the analysis and math has been - intentionally - left out, such as input and output impedance, frequency response, etc. - in order to concentrate on the essentials above: mu, gm and Rip. Since a pentode has a screen grid to contend with, calculating voltage gain with it is slightly different - than with a triode. In the datasheets - where the mu is given, the mu of a pentode is derived by strapping the screen to the plate (to make a triode), so the (given) mu will produce erroneous pentode voltage gain estimates. Instead, we'll use the gm. Also, note the internal plate resistances of pentodes (> 100k for pentodes vs. < 10k for triodes). The formula for calculating pentode voltage gain follows. With a 12.5k external plate resistor in this C3m circuit, the voltage gain becomes a whopping 77 - yet the circuit does produce an acceptable level of distortion. In the diagram above - with the 12au7, two sections of a dual triode can be paralleled by strapping their grids and plates together. Paralleling triodes doubles the transconductance and halves the (internal) plate resistance - relative to a single triode section, but the mu remains the same. The noise performance improves significantly (though it does not double in improvement over a single triode). The cathode and plate resistor values used in parallel triode circuits are - approximately - one half of those in a single triode section. But, why does mu remain the same? The voltage gain, like mu, is identical for parallel sections, as with a single section - as long as the plate and cathode resistors used are dropped by half in the circuit. The output impedance of a stage is indirectly proportional to its ability to drive a following stage. (The lower the Zout of one stage, the more of the signal makes it through to the next.) A cathode follower is used, where a low impedance output source is needed to drive a high impedance stage, such as an output tube. An increasing in voltage input signal causes the plate current to rise, which increases the voltage across the cathode resistor, making the cathode more positive with respect to ground. When the input increases the grid-to-ground voltage by 1 volt, the increase in plate current raises the cathode-to-ground voltage by about 1 volt, leaving the grid-to-cathode voltage virtually unchanged. As the grid voltage increases, the cathode voltage "follows". Hence, the circuit's name. From the RCA 12au7 datasheet, what is the output impedance of a 12au7 cathode follower? Here is a PDF link to the original Ongaku schematic. Notice the cathode follower feeding the 211? Used in Push Pull amps to control the phases the output tubes receive, the long tail pair is a differential amplifier: an increase in the phase inverter's input voltage decreases the inverted output's voltage but raises the non-inverted output voltage. 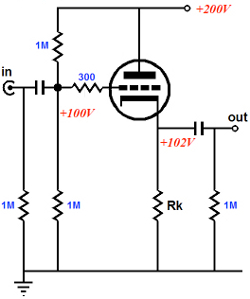 As the input signal voltage rises, the plate current in the left (inverted) section of the dual triode increases, causing the inverted output voltage to decrease - due to a higher voltage drop across the left plate resistor (Ra1). This also causes the current through the cathode resistor (Rb) and the tail resistor (Rt) to rise, which increases the voltage between the cathodes and ground, making the grid-to-cathode voltage of the right triode more negative and causing its plate current to decrease. This, in turn, raises the right (non-inverted output) voltage. If the total current through the two triodes is constant, an increase in the current through one section causes the current through the second to decrease by nearly the same amount. The larger the value in the tail resistor, the more equal the balance, but the lower the maximum output signal swing. The gain of the differential pair is exactly the same as that of a volt amp, but the gain is shared between the anodes. Suppose for an RCA 12au7 dual triode, Ra1 is 82k and Ra2 is 100k. What is the gain, Av, for both sections? The combined gain is 31.3. But, it is shared, so a 1V input will produce a 15.75V signal on each anode. Given: The B+ - in the power supply - needs to be dropped from 466Vdc to 425Vdc at a current draw of 315ma. Problem: what value resistor is needed? Given: The B+ on the screens must be reduced from 304V to 299V at .005A. Problem: what resistance value is needed? Given: A driver tube, a B+ of 450V and the plate current of the tube is 17ma. Problem: what value plate resistor is need to drop the B+ to 225V? Solution: 450V - 225V = 225V; 225V / .017A = 13235ohm. A 12K resistor will do. Given: The above screen voltage drop from 304V at .005A and P = I * E .
Problem: what wattage rating for the resistor is suggested? In practice to drop the above voltage, it would be best to use at least a 3W resistor. A 2W resistor will get hot and possibly become dodgy. 1. Ohm's law will be represented as "i = e / r" throughout. 2. See: gm vs mu and gm and mu in tube testing. 3. "E^2 / R" or "I^2 * R" can also be used to derive power dissipation.